When Junak, the Tongass shaman, returned to Duke Island in 2005, she flew over territory her people had lived in for thousands of years. The land below near the mouth of the Unuk River in southeast Alaska, which is thought to be named after her, was still just as beautiful and pristine as when she was taken away over 100 years before. The plane returning her remains flew over Saxman and Ketchikan, giving her a good view of the string of islands in the Tongass National Forest where she once lived. Her physical eyes had long ago lost their ability to see, but her spirit eyes still worked and, according to ancient Tlingit beliefs, part of her spirit will always stay with the body. She was there. And while her spirit once flew through the sky on its own during trances in which she cured the sick, now a plane did the flying for her. Junak returned after over a century in exile to see her homeland, and even the very river named after her, threatened with poisoning by two massive mines, the KSM and the Brucejack, both miles away in Canada. Long before large undeveloped gold reserves were discovered a few miles upstream in British Columbia, the land near the mouth of the Unuk River was being plundered for riches of a different kind: Native artifacts and ancient human remains. In 1897, George Dorsey, curator of the Field Museum in Chicago, went to Alaska to get artifacts and skeletons of Native people for his museum’s collection. The remains of Junak, the Tongass shaman, whose grave on Duke Island near Ketchikan was looted in 1897 by George Dorsey of Chicago’s Field Museum of Natural History. 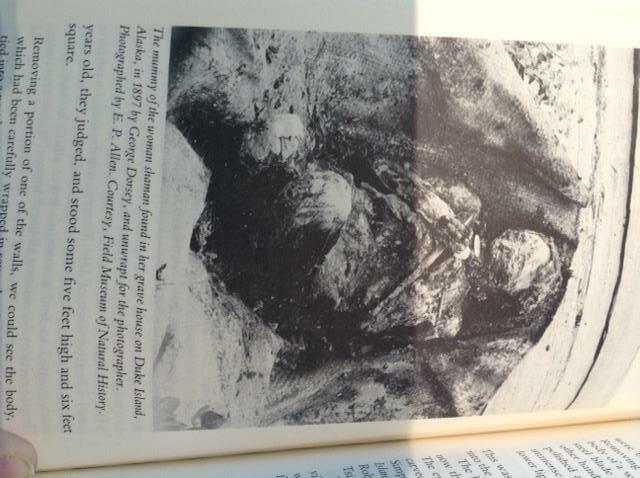 Photo appears in the book, “Captured Heritage: The Scramble for Northwest Coast Artifacts” by Douglas Cole. Dorsey plundered hundreds of Native graves from Montana to British Columbia, opening them without permission, stealing the bones, and shipping them back to Chicago for storage and study. This is how, in the summer of 1897, Junak the Tongass shaman, became Field Museum accession number 592. Irene Dundas, now an Indigenous Outreach Coordinator for SEACC (Southeast Alaska Conservation Council), was only 19 and a student working for the Native-owned Cape Fox Corporation when first introduced in 1994 to the repatriation of Native artifacts. 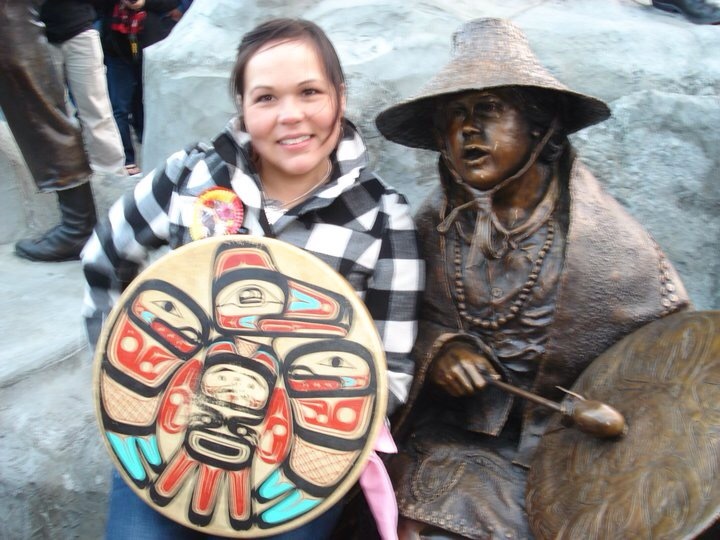 Irene Dundas, an Indigenous Outreach Coordinator for the Southeast Alaska Conservation Council, stands beside a bronze statue of a Tlingit woman drumming that she posed for in Ketchikan. Dundas was pivotal in securing the return of Junak, the Tongass shaman, whose remains were stolen by a Chicago museum in 1897. Photo courtesy Irene Dundas. A Tlingit from Ketchikan of the Tsaagweidi clan, Dundas was eventually drawn to investigate a particular set of Tlingit remains taken from nearby Duke Island and being held at Chicago’s Field Museum of Natural History. Over a period of several years Dundas performed extensive research to identify and eventually repatriate the remains according to the requirements of the federal law NAGPRA, the Native American Graves Protection and Repatriation Act. Dundas explained the identification finally came down to one missing piece of information. The shaman had been interred wearing a ceremonial robe and also a apron bearing an image of her house crest, an animal associated with the group’s history. This animal would clearly identify her house group, or kwaan, but the problem was the image was so faded it was unrecognizable. Dundas solved the problem by having the image photographed with a special infrared camera to make it visible. “It was a raven. She was of the Taant’á kwāan Raven House,” Dundas remembers. This physical link allowed Dundas to identify the remains as a female shaman named Junak written about by anthropologist Ronald Olson. She had been a song composer and was renowned for her premonitions. Her name and the Unuk River named after her both mean “to dream” in Tlingit. With identification and ownership established, NAGPRA officials granted repatriation, and Dundas was allowed to bring Junak back home to Duke Island. The care given to her original interment showed how much respect the people had for her. She was their connection to the spirit world. As a Tlingit shaman, or Ixt, she healed the sick by mystical means, but also, I’m sure, by listening to their problems, giving them advice, and helping restore balance and harmony to their minds and hearts. Junak, once only a nameless museum relic, accession number 592, now has a name, a history, a people and a home. Junak’s return also marks a time when the Unuk River, which fed her people both physically and spiritually for thousands of years, is being threatened by two time bombs ticking away upstream just across the border in Canada, the KSM and the Brucejack mines. 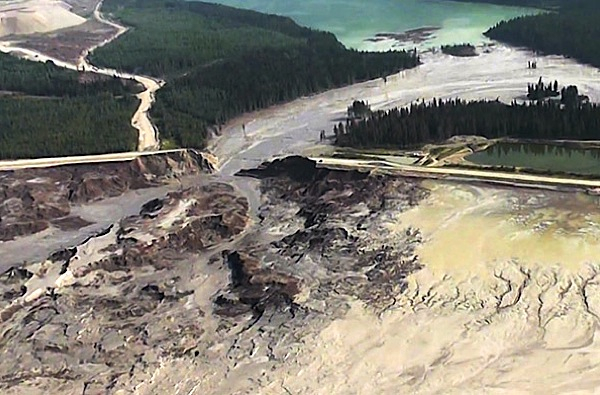 In August 2014, the tailings dam at the Mount Polley copper and gold mine in British Columbia gave way and over 24 million cubic meters of mining waste flooded Polley Lake, Hazeltine Creek, Quesnel Lake and the Cariboo River. Vast swaths of once pristine wilderness and waterways were transformed into barren, poisonous moonscapes. To date no charges have been filed against the mine’s owner, Vancouver-based Imperial Metals, even though company whistle-blowers had warned for months the tailings storage facility was unsafe. The callousness of mining companies does not surprise Frederick Otilius Olsen Jr., Tribal President of the Organized Village of Kasaan and chairman of the Southeast Alaska Indigenous Transboundary Commission (SEITC). “These mining waste ponds are supposed to last forever, even after the mine has closed. But the Mount Polley storage facility only lasted 20 years,” he said in a recent interview. The problem now facing the Unuk River, and also the Stikine and Taku rivers in southeast Alaska is the threat of similar mines being developed just across the border in Canada. The Kerr-Sulphurets-Mitchell (KSM) mine and the Brucejack mine sit just above Sulphurets Creek, which feeds into the Unuk. The proposed tailings storage facility will be 27 times bigger than the one that burst at the Mount Polley mine. Disasters are not contained by lines on a map, but the laws related to them often are. This has allowed mining companies in Canada to push mining projects through the permitting process without meaningful engagement with the indigenous communities downstream from them, communities that relied on the rivers for subsistence, income and cultural significance since time immemorial. On March 12 and 13, leaders of over 30 indigenous communities from both Alaska and Canada met near Seattle at a summit conference sponsored by SEITC to discuss the threat posed by ten mines, including the KSM and Brucejack, in various stages of development in northwestern British Columbia. So does Junak. Her return home signals an awakening of concern among the Native people of Alaska and British Columbia to the threat posed by transboundary mining development. Just as she once cared for her people, they now wish to care for her, and for the rivers she embodies. This entry was posted in education, Events, Youth Leadership and tagged alaska, Alaskan Native, Frank Hopper, Last Real Indians, LRInspire, mining by lrinspire. Bookmark the permalink. Beautiful story Frank and I hope a call to the governments to work with the Indigenous peoples of this land and only operate with their consent. No more pillage of the spirits. Congratulations to Irene Dundas for repatriation of Junak. Great history Frank. It’s not a story it’s true history.